THE maelstrom that hit global financial markets a decade ago is known in Japan as the Lehman Shock, after the bankruptcy of the American investment bank that caused it. Japanese banks themselves escaped relatively unscathed, owing to defences built during the 1990s, when the country struggled with deflation and excessive debt. But they seem to have forgotten the lesson. Risk-taking is back. Squeezed at home by razor-thin margins and negative interest rates, both major and regional banks have been on a spree abroad. Banks have more than doubled borrowing and lending in dollars since 2007. Dollar-denominated assets of Japanese banks topped $3.5trn at the end of 2016, according to the Bank for International Settlements (BIS) in Basel. That leaves them vulnerable to currency swings and external shocks, it warns. 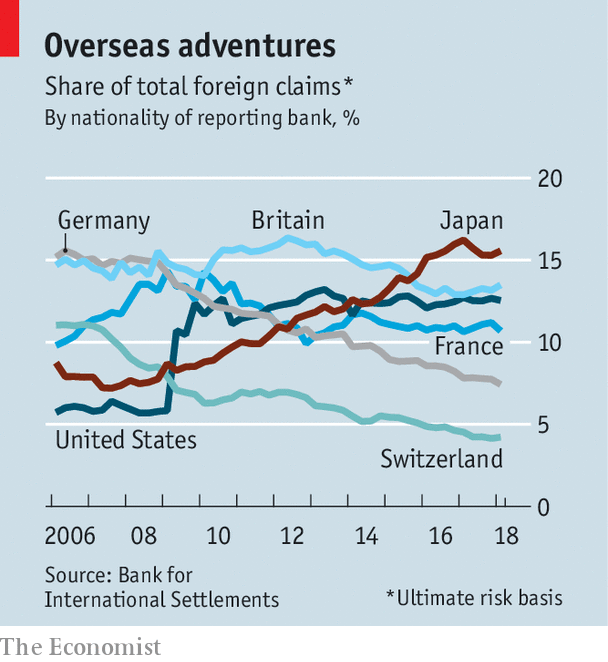 Pantheon, a consultancy, compares the way the foreign-currency balance-sheet of the Japanese banking system has evolved with those of five other rich countries with internationally active banks: Britain, Canada, France, Germany and Switzerland (see chart). France and Germany still have a smaller safety margin, but only Japan’s liquidity ratio (ability to cover funding outflows in a short period of stress) has worsened since 2006. Japan has “bucked the global banking trend of greater caution in foreign activities”, it says. The BIS describes a game of financial musical chairs. Japanese banks were heavily exposed in the Asian meltdown of 1997-98. When they cut down on credit, European competitors stepped in. The crash in 2008 and the European sovereign-debt crisis that kicked off in 2010 sent the interlopers scurrying for cover. Japanese banks, less exposed to those crises, expanded their lending, relying heavily on volatile swap-market funding to do so. Such fears were among the reasons why the BoJ introduced “yield-curve control” two years ago, says Freya Beamish of Pantheon. This policy aims to keep long-term rates higher than short-term rates, easing the pressure on banks to seek higher returns abroad. Though at first it seemed to work, banks and insurers have begun building up foreign exposures again. This week was marked by speculation that the BoJ is considering further tweaks, and that it may taper its quantitative-easing policy sometime this year—much earlier than had been expected. That pushed up Japanese bond yields, with an effect that rippled out to America and Europe. The BoJ may stay its hand for now: inflation remains stubbornly below its target of 2%. But Japanese banks’ foreign adventures are certainly complicating its task. Ms Beamish sees the potential for “several vicious spirals”. Japanese institutions could find themselves unable to roll over short-term dollar funding, forcing them to sell assets quickly to repay loans. That would damage their balance-sheets, raising the interest rates demanded of them and further weakening their position. If they were to liquidate yen assets to repay loans, this would drive the dollar up further, again squeezing global liquidity. Nobody is predicting imminent meltdown. Banks in Japan are flush with liquidity, notes Takuji Okubo of Japan Macro Advisor, a consultancy. But five years of exotic financial engineering, from quantitative easing to negative interest rates to yield-curve control, have left the yen “abnormally” weak, says Mr Okubo. They have also left the BoJ with fewer options.